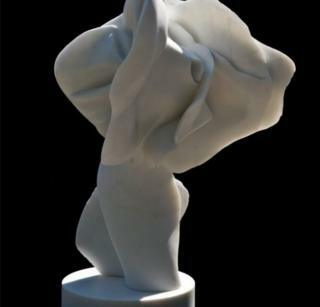 Sculptures by Henry Moore and Helaine Blumenfeld, including some previously unseen works, are to go on show in London. The art is being installed in Bowman Sculpture, central London, to mark the 30th anniversary of their seminal joint exhibition in New York. A British Dialogue: From Perry Green to Cambridge went on show at the Alex Rosenburg Gallery in 1985. The exhibition reuniting their pieces takes place from 22 May to 30 June. Sculptures from the private collections of the artists - who are considered radical pioneers in the art of carving and sculpture - will also go on show. Art critic and lecturer Alan Caine said: "Moore and Blumenfeld are two sculptors who share an interest in elemental images usually based on the human body. "They also share a level of abstraction which does not dwell on narratives, personalities and direct portraits but searches for a spiritual dimension which is monumental and in many ways transcendent." Born in 1942 in New York, Blumenfeld is now based between studios in the UK in Cambridge and Pietrasanta, Italy. Yorkshire man Henry Moore died in 1988 aged 88. He was best known for his semi-abstract monumental bronze sculptures which are located around the world as public works of art.